The USDA Food Pyramid recommends two-four servings of fruit for the healthy adult daily diet. To aid the community in achieving this recommendation, the Kiwanis Club of the Haddons is conducting its annual Florida Fruit Sale through Nov. 21. Offered this year are high quality 2/5 bushel (20 pound) boxes of: naval oranges for $25; ruby red grapefruit for $25; tangelos for $25; or mixed orange/ grapefruit for $27. Also available are a 23 to 25 lbs. 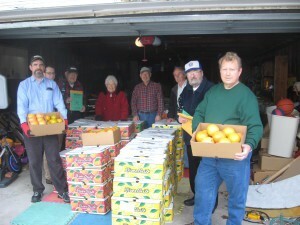 box Apples-Oranges-Grapefruit for $30 and a 23 to 25 lbs box Tangelos-Oranges-Grapefruit for $30. To place an order call Kiwanis Club of the Haddons’ Florida Fruit chairman John D. Wilson at (856) 858–1640 or (856) 833–0401 or e-mail him at willaw1@verizon.net. All orders will be filled in mid-December. Kiwanis is a global organization of volunteers dedicated to changing the world one child and one community at a time. The Kiwanis Club of the Haddons meets Fridays, 12:15 p.m. at Tavistock Country Club in Haddonfield. All citizens concerned with the healthful development of our community are welcome to join.